Layla gets all of the presents. 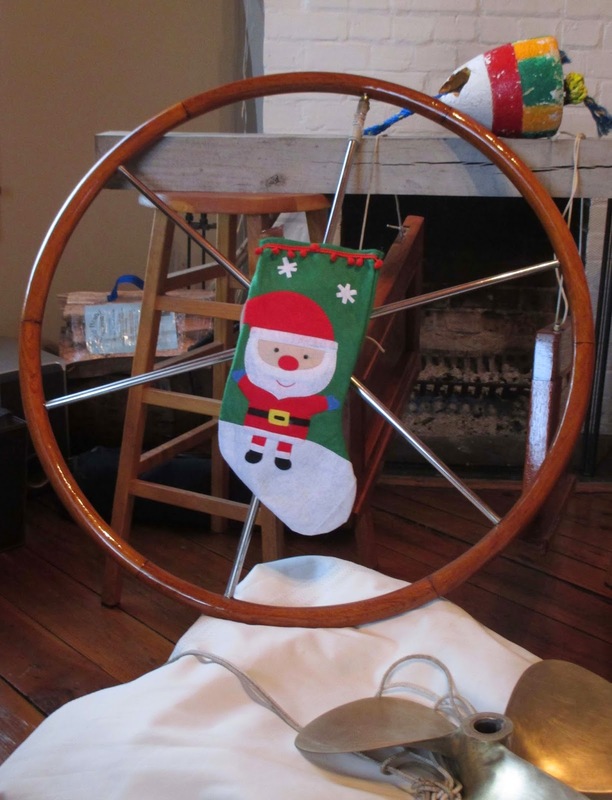 Her wheel and companion way doors are varnished and the prop has been cleaned. She got a lot more stuff this year. We need to catch up with all of you. To answer the recurring questions, “Where are you?” and “What are you doing?” We are still here in North Carolina. 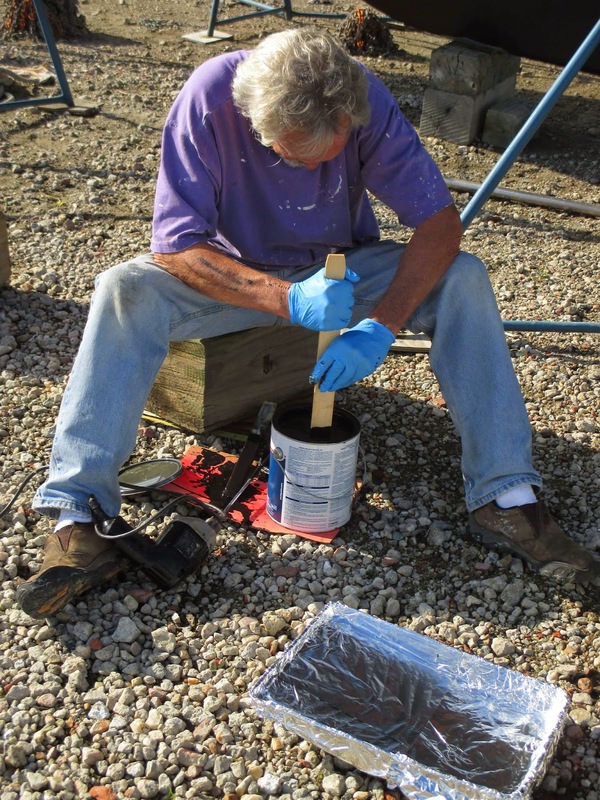 Boat projects and house projects have filled our days. We don’t have time for a real job. There is so much to do. Some days a “real” job might be easier. At least it would pay better, and maybe offer better working conditions. From putting on a new roof, repairing drywall and ceiling leaks from the old roof, replacing a broken window, jacking up and repairing the front porch posts and flooring, replacing siding, painting porches, to various other projects, we have worked hard to get this 156 year old house in shape before our departure. Have we told we have the oldest house in town (still standing)? 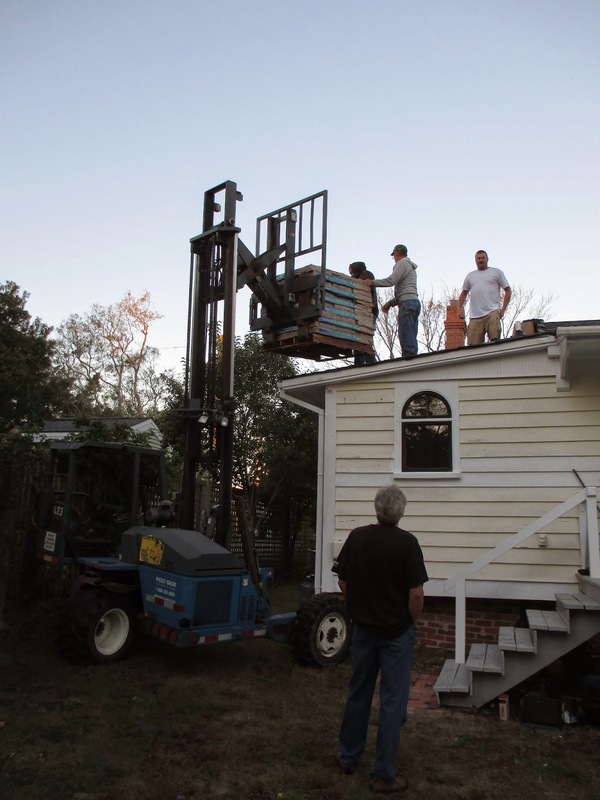 Corky and his crew unload our new roof. 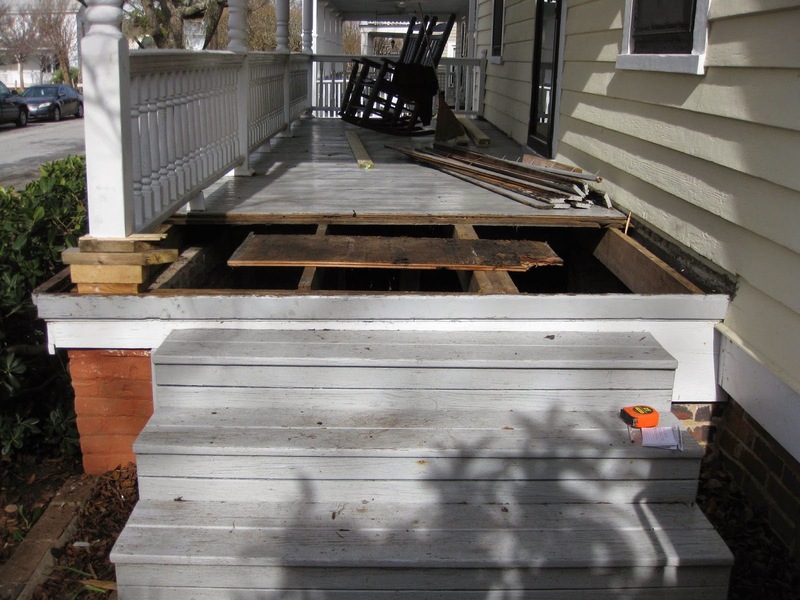 Removal of rotten porch floor boards and posts to be repaired. We updated Layla’s maintenance and repair log to review our work since she became ours. The list is over seven typed pages with over 200 items either replaced with new, or repaired, painted, and cleaned (sometimes multiple times). 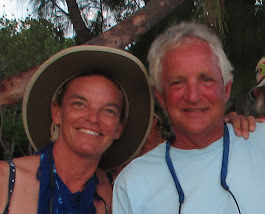 The common lament among boat people is that fixing stuff is not so bad. It is the fixing of things two or more times that is infuriating. We know the truism that there is always something else to fix. You are never done. Believe me we understand that. Far too often we will tackle a simple task and have it explode into five or six more. There are far too few simple tasks. We have found this endeavor can be more of a marathon than a sprint and, despite our best efforts, waiting on parts, ordering wrong parts, sending things back, rainy days, and cold days all conspire to thwart schedules and plans. We reluctantly learned the need for patience and have accepted that all things related to a boat have their own schedule beyond our control. Control is elusive. One example of the tests to our patience, on a quick check on the top of the mast last week we saw part of our navigation light had ripped off, apparently during the hurricane last summer or another storm since we have been back. We ordered and received a replacement part and hiked back up the mast to find that the part didn’t fit because we have a different brand. There is no replacement part for our brand of light. We would have to order a new navigation light, which was in limited supply, would take 3 weeks for delivery, and was the most expensive of all brands. We decided to order a different navigation light which should arrive Christmas eve. Then we have our least favorite job, hanging 60 feet off the ground juggling tools, nuts and bolts, and making electrical connections to install it. We have replaced this navigation light once before. We let it go and stress is reduced – we have at least that control. At the end of the day, we tally the achievements, the tasks completed, and those that are getting close to being done. We celebrate all of our accomplishments. Even the tools to fix things need fixing. 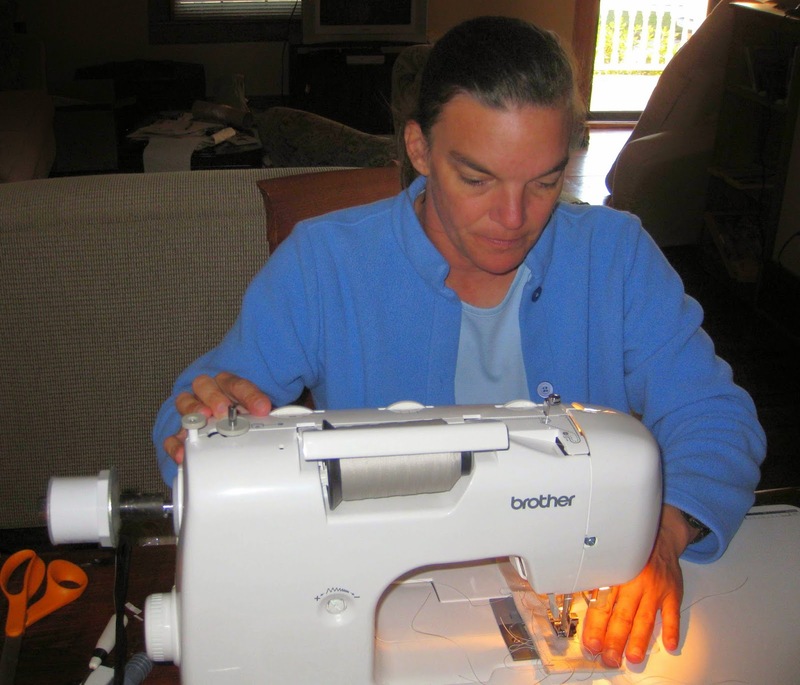 Here we modified the sewing machine after it broke going through several layers of canvas. Canvas is one of our success stories. We made canvas covers for the propane chest, the line chests, the butterfly hatch, the helm seat, the cockpit table, the wheel, the autopilot control unit, and the grill. We are close to the “splash” – putting Layla in the water. 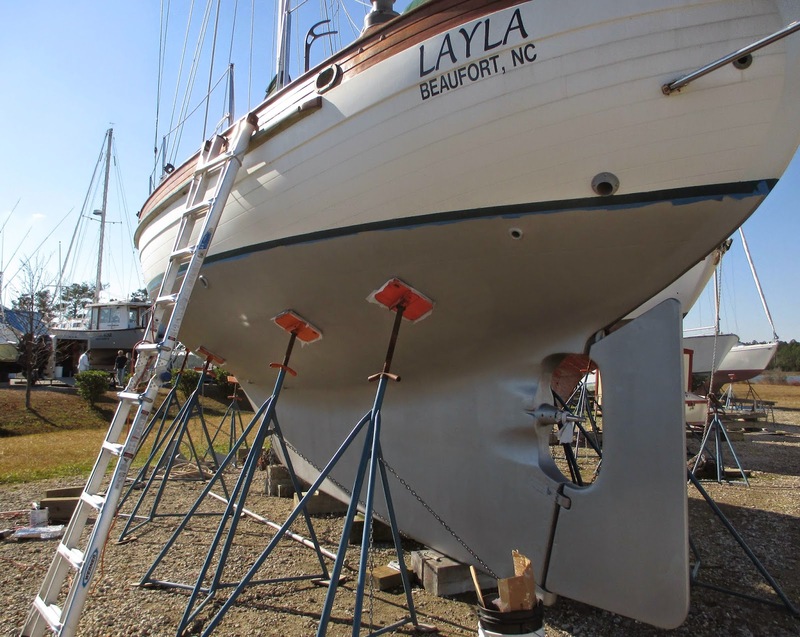 The boat yard can schedule Layla after the holidays. One of the last tasks to be completed before going back in the water is done. 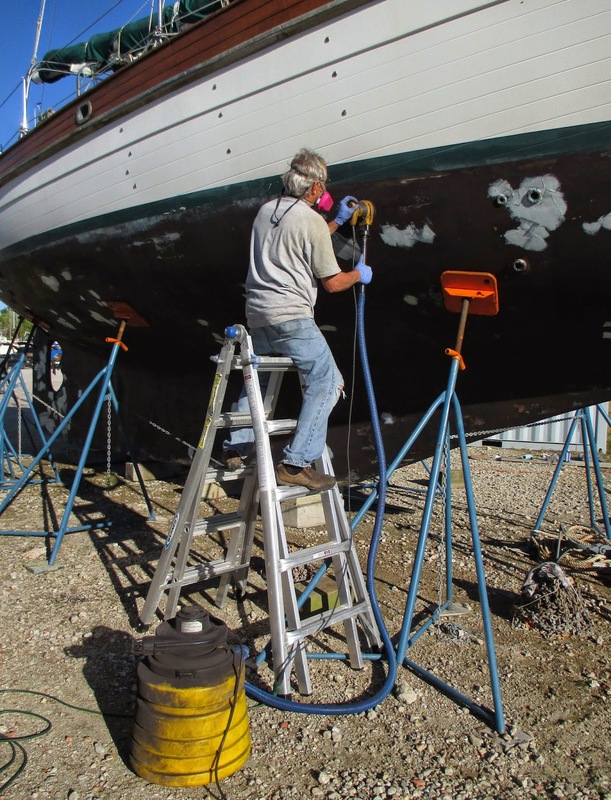 Her bottom has been sanded, primed, and painted with three coats of antifouling paint. 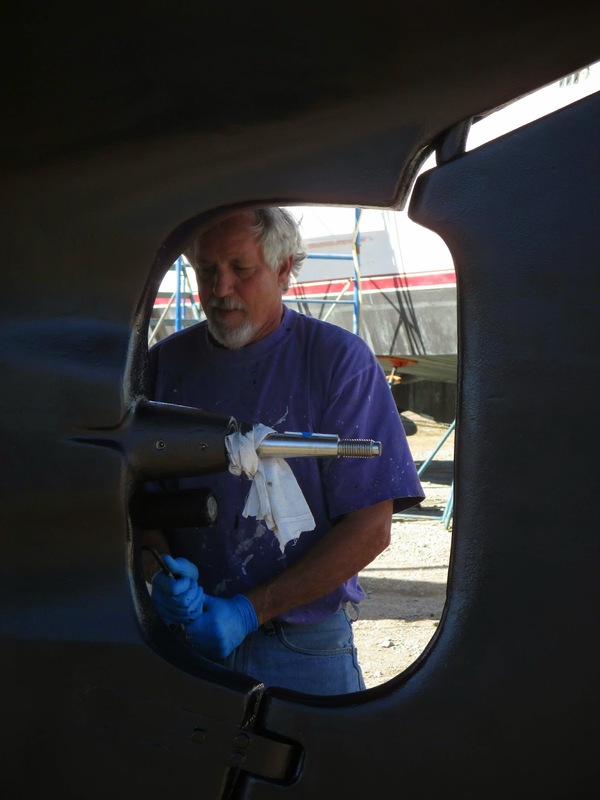 Bud sanded Layla’s bottom after patching some blisters on the hull. Layla in her ‘silver slippers’ with her brand new coat of primer. The folks in the yard loved her look. No one wanted to see her painted over with black bottom paint. Bottom paint demands a lot of stirring if it has sat around for a while. This last coat of bottom paint around the prop area means we are ready to go. We have removed a lot of stuff from the boat as we needed space for working on projects. Most of the stuff is in the “staging area” (the second bedroom in the house), but spills into nearly every room of the house and the outside shed. All of this is sorted (mostly), cleaned, and ready to be placed back on Layla. We have arranged a temporary slip on the Beaufort waterfront. We will check out the new autopilot, the water generator, engine, and refrigerator/freezer in the water. The slip at the dock will give us a convenient means to reload and provision the boat. There you have it. We know many of you are as eager as we are to see us on the water and heading south. 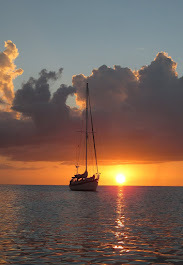 We understand the adage that sailing/voyaging can be more about intentions than schedules. We intend to be in the water within the next couple of weeks. And after a shake-down for testing all the new equipment, we intend to combine passages both offshore and the Intracoastal Waterway for points south. 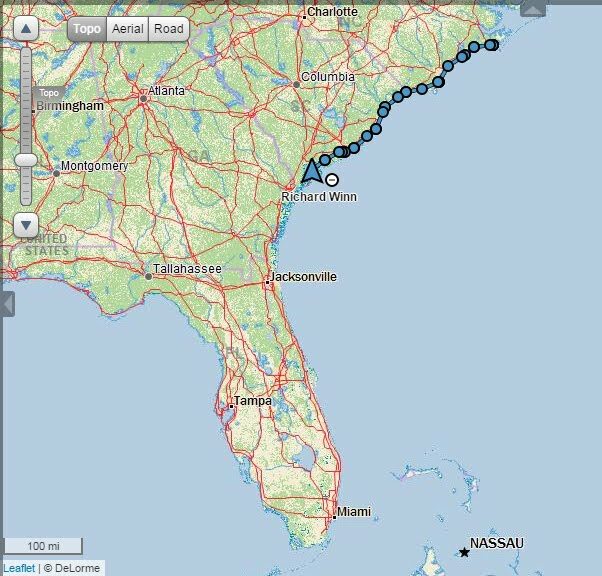 Depending upon the weather, we intend to jump off from Florida to the Bahamas. We will keep you posted. May you all have a wonderful Christmas and bright New Year! Don’t forget to get those passports if you want to visit!